We can provide the perfect soundtrack to your wedding day. From Rock Bands to Klong Yao (Thai Drum Parade), we have what it takes to get your party started. We can organise hair stylists and make-up artists for you and your family, with a choice of western and Thai styles. A meeting can be arranged before the wedding day so you can select a hair style and look that suits you best. We work with a number of qualified freelance photographers and videographers who have been specially selected for the high calibre of work they regularly produce for our clients. The final product is a CD/DVD of all shots taken, a photo album of selected pictures and a framed picture. Other options like a digital diaporama of your favourite images set to music are also possible. 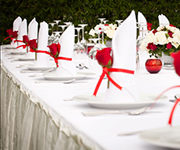 Couples requiring these services should let the Wedding Planner know so she can reserve the service in advance. 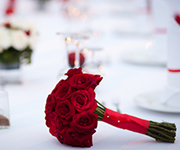 The most common flowers that we use in weddings are white orchid, water lily and jasmine. These particular flowers are amazingly beautiful, weather tolerant, reasonably priced and most of all they project an image of Eastern culture. Nevertheless, we are happy to supply other flowers that you may desire. Below list is included in the East Meet West Celebration and Thai Ceremony but if you wish to expand the decoration, we are happy to arrange that. It is a traditional Thai custom to give a small souvenir to the attendees of the wedding. Many couples bring their own souvenirs from overseas. However if you wish us to find something for your beloved guests, we can supply souvenirs such as bamboo strip fans, aroma candles, paper umbrellas, etc. Koh Samui is famous for its coconut, so coconut shell crafts and products are available. Fireworks are commonly used in celebrations in Thailand. It is incredibly entertaining and extremely remarkable. 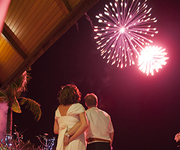 We have local firework shops on the island to provide this service. The experienced team will be in attendance at all times from the firework set up to the last spark to guarantee your safety and ensure that all procedures go according to plan. Sky Lantern's originally came from the Northern part of Thailand. They are now used all year round for celebrations, auspicious occasions and tradition festivals like the Loy Kratong Festival. It is considered good luck to release the sky lantern as it is believed it will convey our wishes to heaven. The sky lantern is also symbolic of your problems and worries floating away.